What was Paul asked by the voice from heaven? Saul, Saul, why are you persecuting me. Personal from Herbert W Armstrong - WITH this 28th Anniversary number, The PLAIN TRUTH takes one more important leap ahead. Only last June it was increased from 32 to 40 pages. Now, with this issue, 8 more pages are added. You have in your hands, now, a magazine enlarged to a full 48 pages! This latest expansion brings to me personally a very rewarding sense of satisfaction, with deep and heart-felt gratitude to the Great God who has prospered and built this great worldwide Work. It is one of the rich rewards God has given after 28 years of hard• ship, struggle, opposition, hard work and perseverance. Mrs. Armstrong shares this gratitude and rejoicing, just as she also has shared those years of hardship and diligent industry as my constant loyal helper. 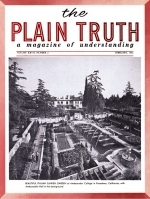 When The PLAIN TRUTH was stepped up to 40 pages, with the June 1961 number, I took our readers behind the scenes, to show you how this magazine is written and produced. I introduced to you, with their pictures, 23 key members of our world-wide Staff.